Karrubi vows to "stand by the people and the revolution, until end of my life"
TEHRAN, Iran (CNN) -- Iran's government was accused of blocking publication of a reformist party's newspaper Wednesday to prevent it publishing a letter from a presidential candidate questioning the legitimacy of Iranian President Mahmoud Ahmadinejad's victory in last month's election. Iranian President Mahmoud Ahmadinejad had been due to travel to Libya on Wednesday. Meanwhile, questions surrounded an announcement in government-run Iranian media that Ahmadinejad canceled a planned trip to Libya on Wednesday for undisclosed reasons. In the letter due to be printed in the Etemed Melli party newspaper, Mehdi Karrubi vowed to "stand by the people and the revolution, until the end of my life," describing the actions of the government over the June 12 vote as "the foundation for the annulment of the elections." "I will not recognize the legitimacy of the government which has resulted from this process," the 72-year-old cleric and former parliamentary speaker wrote. Karrubi's letter was instead published on the Etemed Melli Web site. The party said Iran's Ministry of Culture and its Attorney General prevented the publication of its newspaper because it carried the letter. Karrubi, dubbed the "Reform Sheikh" by Iranian media, is a well known political figure in Iran and received international press in 2002 when he led a walkout to protest the jailing of a fellow politician who called himself a reformist. He and fellow reformist candidate Mir Hossein Moussavi have questioned the legitimacy of the vote count of the presidential election that gave Ahmadinejad an overwhelming victory. That result sparked bloody street protests and a clampdown on international media coverage, as well as access to certain Web sites. The protests have largely dissipated, but another leading Iranian reformist, former President Mohammad Khatami, said "all doors are not yet closed." "We must not lose our social capital this easily," Khatami told progressive Iranian newspaper Tahile Rouz. "I know Moussavi as one of the faithful, original and valuable capitals of our revolution and considered his return to the political scene, as a great chance. "The current militarization of the security environment must change and society must be taken towards calm and I believe that all doors are not yet closed," Khatami said. Human Rights Watch on Wednesday called on Iran to release prominent Iranian reformist Saeed Hajjarian, who has been imprisoned since June 15. He is one of several jailed reformists accused of orchestrating the post-election violence in Iran. Hajjarian, 55, was severely disabled after he was shot in the head in a 2000 assassination attempt that left him confined to a wheelchair with severe brain and spinal cord injuries. His wife, Vajiheh Marsoussi, is a physician and has visited Hajjarian in Tehran's Evin prison. She told HRW that his medical condition was "deteriorating severely." Meanwhile, Iran's government-funded Press TV said Tehran released three more British Embassy staffers who had been arrested on Saturday. One staff member remains in detention. Five other Iranians who worked for the British Embassy were released earlier this week, an Iranian Foreign Ministry spokesman said Monday. Britain's Foreign Office in London would not comment on the latest report, but an unnamed spokeswoman said, "It is unacceptable that they are being held and we want them all released. Allegations against them are unfounded." On Monday, the Foreign Office confirmed that "some" staff had been released, but would not say how many. Iran's intelligence minister has blamed Western powers for stirring up protests over its disputed presidential election, singling out Britain and saying the British Embassy in Tehran "played a heavy role in the recent disturbances." For unknown reasons, Ahmadinejad's trip to Libya on Wednesday was canceled, according to Iran's semi-official Fars News Agency. 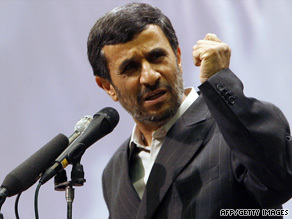 Ahmadinejad was scheduled to attend an African Union summit in Sirte, Libya. Four days after the controversial election, Ahmadinejad went to Russia to meet with leaders there, where he was welcomed as the "newly re-elected president of Iran" despite the ongoing street protests. He returned to Iran that same day. He is due to be sworn into a second term later this month, after Iran's election authority completed an investigation into alleged voter irregularities. The Guardian Council announced this week that its partial recount confirmed the initial results giving the hardline incumbent president an overwhelming victory.